The buoys stand outside the Art College, (part of the University of Ulster), at the corner of Donegall Street and York Street. When erected in 1979 they were quite a novelty and included jets of water squirting from below. Time (and various elements of aerosol society) has not treated them well. The jets of water are no more. They were a gift from the Commissioners of Irish Lights. There is the following application (16 August 2018) for planning permission “LA04/2018/2201/F Relocation of historical shipping buoys from Cathedral Gardens to Titanic Quarter to form part of the envisaged 'Maritime Mile'. This will include: new natural stone plinths set within an existing grass area (gentle rippling of the grass surface is to be undertaken with new fibresand structural soil to allow for DDA access whilst maintain natural grass surface), two new street lighting columns approx. 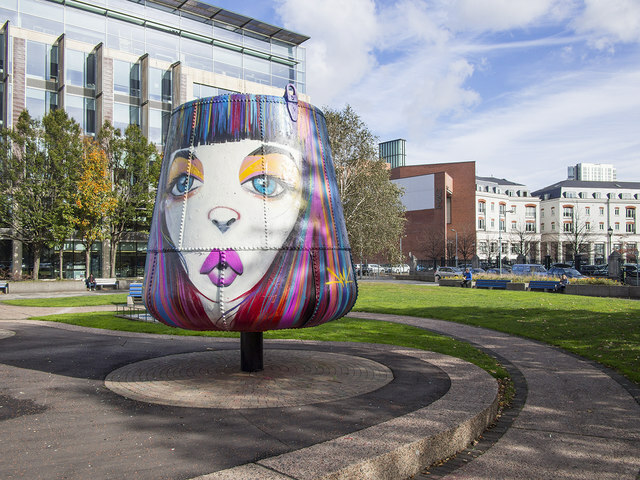 8m high incorporating Gobo video projectors to project shimmering water effect onto grass surface and LED down lighters to downlight the buoys, and one information board Green space lying immediately to the West of the Premier Inn Titanic Quarter Postcode BT3 9DT”.